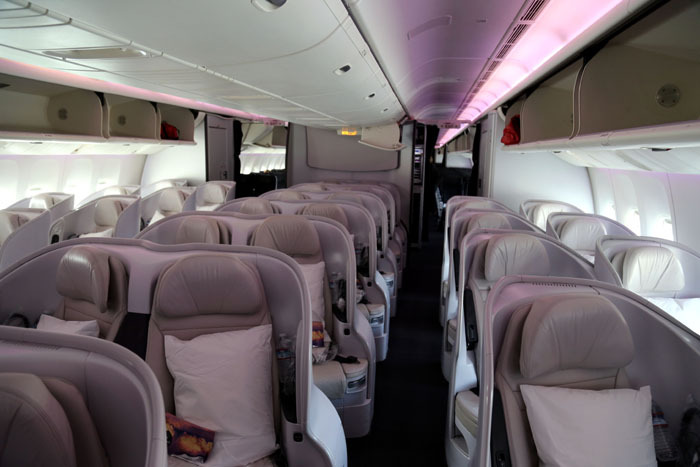 Premium Economy at Air New Zealand – Enjoy the space! 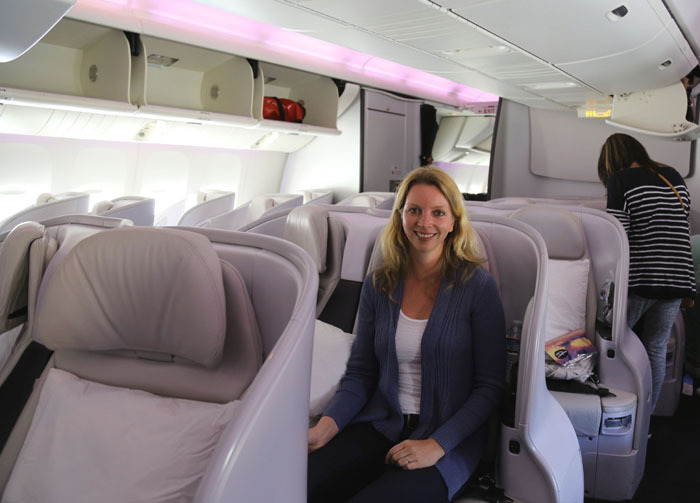 A trip to New Zealand from Europe is already half a world trip and not only for larger travelers like me the Premium Economy Class at Air New Zealand offers much more space! Until today I’ve pinched myself (1.84 m tall) on each trip into the Economy seats, but on my return flight from Auckland via Los Angeles to London I tried the Premium Economy and Premium Economy Seat Space Air New Zealand – and I’m thrilled! The service begins at check-in, because for Premium Economy customers there is a separate check-in area. Even there I have to check in by myself at a terminal, but a very nice lady helps me with that and sticks instantly the strips with the destination and a priority sign at my suitcases. 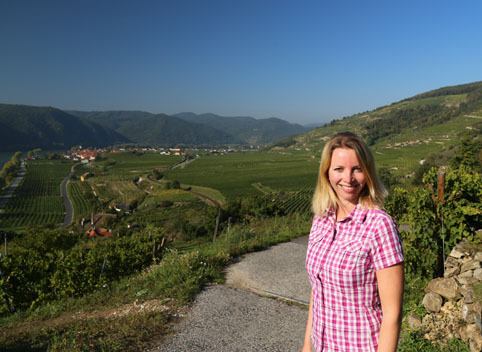 The best part: Unlike the Economy I am allowed to take two bags each weighing 23 kg and have plenty of space for all my souvenirs – in particular the New Zealand wine comes with large amounts of weight. Also at the gate I do not have to wait for a long time. Whoever flies premium, can enter the airpline first with the Business Class passengers and Frequent flyers. 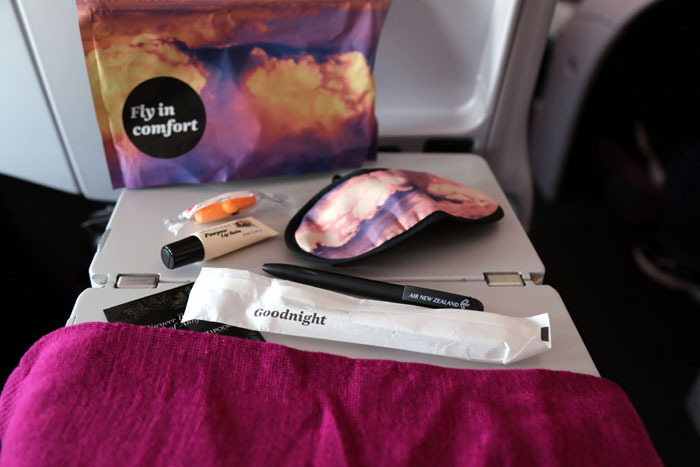 On my seat I find a nice amenity kit with sleeping mask, toothbrush set, lip balm, earplugs, sleeping socks and pens. 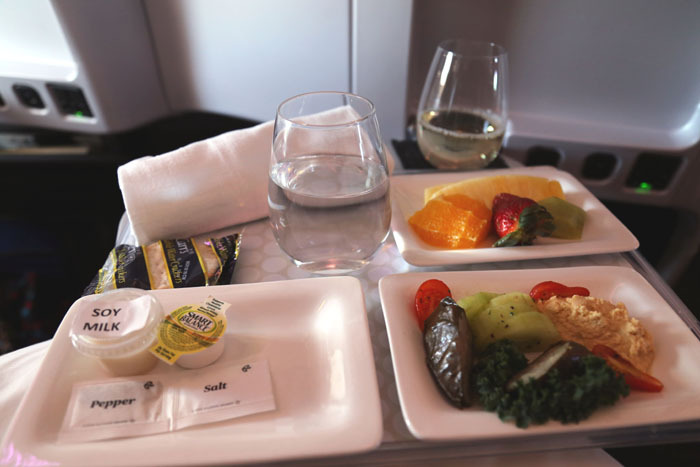 I take a seat, drink some water from the bottle at my place and scan the movie selection, while Hilary – who manages the Premium Economy class with her colleague – hands me a hot towel to freshen up. On the route Auckland – Los Angeles I sit on one of the luxurious leather seats in the Premium Economy of the Dreamliner. At the windows there are two seats, between the aisles are four seats. Although I have a place in the middle of the row of four, I can relax because of the seat width of 49 cm and a seat pitch of 104 cm. After the welcome champagne in a real glass (in the Premium Economy there is no plastic tableware) a menu is served with fine cutlery. As white wine lover I can choose between New Zealand Sauvignon Blanc or Chardonnay, for red wine fans there are also two different wines from the country of origin of the airline to choose from. The vegetarian dish I ordered already when booking and get my menu served before everyone else. 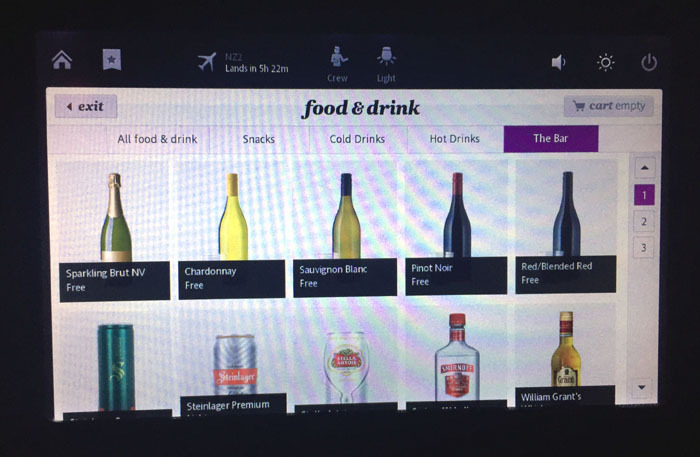 At an Air New Zealand fligth no one has to go hungry: The airline has designed 14 different menus for guests of different religions and ethnicities and passengers with special dietary requirements. I would call that a great service! The flight to Los Angeles takes about eleven hours and I leaf through the entertainment menu. The movies are sorted by genre and by language, so I select one of the latest films in German. 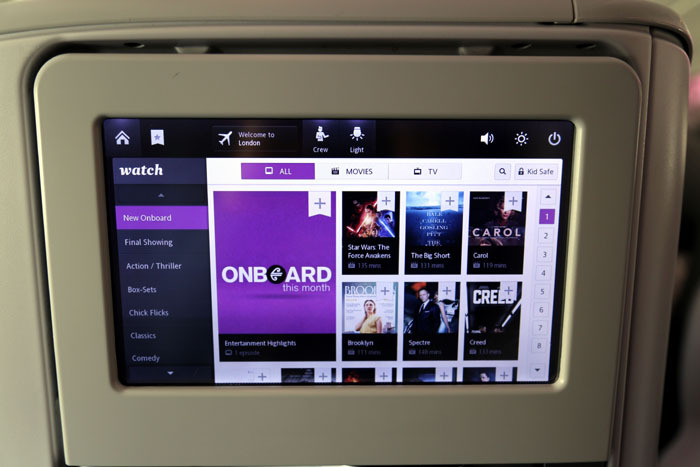 While watching movies I like nibbling and at the Air New Zealand aircraft I can place my order at my personal entertainment system during the whole flight,. Hilary brings free snacks and other drinks immediately. This is super handy, because I do not need not stand up or have wait until the flight attendants come around. Incidentally, this great service is also available in the “normal” economy. Soon I fall asleep in the comfortable seat until I am awakened by the announcement of the captain for breakfast. I am really impressed by the Premium Economy Spaceseat with its new design. On the route from Los Angeles to London I try the new seat, which is integrated into a solid shell. So I can at any time – even while eating – sit back comfortably with my seat inside the shell and do not disturb other guests. Per row, there are only six seats, two each at the windows, and two in the middle. With so much space tothe hours on board go by quickly. After a dinner with two courses I order another orange juice and some biscuits via the entertainment system with its 10.6-inch monitor and watch the latest movies. After a few hours of sleep it is already time for breakfast with cereals, croissants, fresh fruit and a warm dish of potatoes, scrambled eggs and beans. Relaxed and strengthened I then get off in London and I am amazed how quickly a trip from New Zealand to Europe is over. More than 13 million passengers travel annually with Air New Zealand and use more than 4,000 daily flights to over 50 destinations. With the Premium Economy Spaceseat the airline is a pioneer in the long haul – and that’s right! Germans travel via different hubs in Asia, North America or Canada to New Zealand. The airline attaches great importance to safety and sustainability, in January Air New Zealand was awarded as the “Eco-Airline of the year” by Air Transport World. 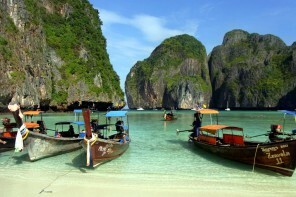 Find further information to destinations and aircrafts at www.airnewzealand.com. Note: This trip was supported by Air New Zealand. The report only represents our own opinion. Exploring the luxury district of St. Petersburg – by speedboat! 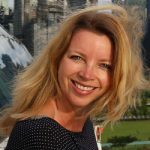 Hey, I'm Brigitte, and beside my fulltime-job I travel as often as I can. At 'just luxe Travel' everything is about exclusive short breaks and weekend trips. 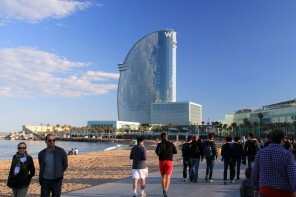 With my reports about city trips, spa hotels and active holidays, I regularly provide you with inspiring ideas for your next short trip!